Overcoming the challenges of relieving compaction in sports turf during the playing season is just one of the problems that under pressure groundsmen and turf care professionals are having to deal with. Dudley Metropolitan Borough Council are no different and had a need to relieve compaction in four winter sports pitches. 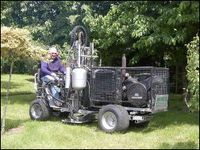 Russell Norton, Technical Manager of the Green Care Section, (part of the Directorate of Urban Environment Management Division) called in our Airforce Terralift machine so that compressed air could be injected below the normal depth of grass root zone and into the the hard pan where normal turf aeration machines such as verti drain or slitters could not work. The decision to the Terralift machine came after a test was carried out between our Terralift machinery and two other companies who carried out rotodrain and verti draining at Dudley Wood Playing Fields. The pitches are all used equally by local clubs have the same subsoil of pit spoil and heavy clay. As a result, all three of the pitches on the site suffered with poor drainage due to compaction and a hard pan layer. The test was an ideal opportunity to compare the three different aeration methods and Terrain Aeration's results came out favourable. Russell Norton said “The Football League and Football Forum found that the pitch treated by Terrain Aeration stood up better to the rigours of play, and the company’s aeration process had a better impact on the pitch.